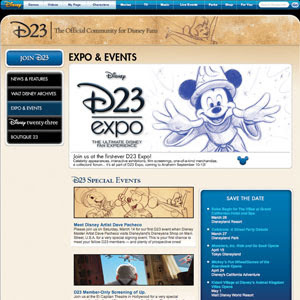 Home � News and Announcements � D23: The Official Community For Disney Fans Has Arrived! D23: The Official Community For Disney Fans Has Arrived! Disney has announced the creation of "D23: The Official Community for Disney Fans." In order to provide their expansive fanbase with the information that they crave, Disney has created this new community. The group got its name from the fact that Walt Disney opened his initial Hollywood Studio in 1923. There will be a membership opportunity that will have many benefits, including a new Quarterly publication: Disney twenty-three , and other special members only opportunities. The membership subscription is $74.99. A Walk with Walt: A look back at the trials and triumphs of the man who made dreams come true and whose imagination started it all. D Society: From gala movie premieres and grand openings to candid Disney moments and memories, D Society takes readers backstage and onto the red carpet. PHOTOfiles: The legendary Walt Disney Archives Photo Library houses millions of Disney's most cherished photographic memories, and the Archives team shares its Top 100, five in every issue. Let the countdown begin! Where in D? : Try to identify where in the world of Disney each issue's mystery photo was taken. The Funny Pages: For the first time in decades, enjoy the vintage newspaper comic strips that helped make many of Disney's most popular characters famous. Making Magic: Crafts for children of all ages, inspired by Disney's favorite stories and experiences. Recipes from Disney's most popular restaurants and eateries, past and present. The website is free and available to all Disney fans, not just the members who pay for a subscription. The website promises to provide the kind of information that Disney fans crave including behind the scenes stories and the latest news and developments. Late-breaking news, press releases, and photos of interest to fans from every part of Disney. "Twilight Bark" — inspired by the Disney animated feature 101 Dalmatians — offers up the latest tidbits and news "bites" from all around the world of Disney. Feature articles and interviews on current Disney topics from theme parks and animation to television and motion pictures, as well as historical retrospectives. Official Disney Bloggers — Get regular updates on films in production at Walt Disney and Pixar Animation Studios, current Walt Disney Imagineering projects, and the Walt Disney Archives. "This Day in Disney" — A daily walk down memory lane. "What's Old Is News" — Go back in time and enjoy rare, vintage and classic articles, stories, interviews, press materials and other highlights from deep within the Disney Archives. "Ask Dave" — Disney Legend and Chief Archivist Dave Smith answers your questions about Disney history. "Archives Library" — helpful Disney reference tools including biographies, filmographies, award chronologies, Disney A to Z updates, historical profiles and other archival information. The online home of Disney twenty-three, D23's quarterly publication. Expanded stories, interviews and imagery. "D Society: Online Edition" — regularly updated photo gallery. "The Funny Page: Daily Edition" — a delightful daily dose of vintage Disney comics that haven't been seen outside the Disney Archives in decades. "Making Magic" — An archive of the unique crafts featured in Disney twenty-three. "Disney Dish" — Always be able to find your favorite recipes from Disney twenty-three. "D23 Expo" — The official Web site for everything you need to know about "The Ultimate Disney Fan Experience" September 10-13, at the Anaheim Convention Center, including programming, show hours, celebrity appearances, keynote speakers, ticket information, vacation packages, and more. "D23 Member Special Events" — Throughout the year, D23 hosts special events created just for its members. Members can find out which ones they want to attend and how to register. 0 comments to "D23: The Official Community For Disney Fans Has Arrived!"